Mumbai: The Indian real estate industry, until recently a booming business, is now struggling for financing from banks, a continued fallout from the Reserve Bank of India’s directive to clamp lending to the sector. Most of the industry relies largely on bank borrowings, though large companies in this business also have access to internal accruals, private equity, venture funds and equity markets. Smaller realty developers typically count on banks for 70-80% of their financing. But after RBI prohibited banks and housing finance firms from lending for land purchases last year, the regulator also made project commencement certificates from civic authorities mandatory for bank funding, making its tougher for developers to access capital from formal lenders. Anand Gupta, the honorary general secretary of the Builders Association of India, which has some 10,000 real estate and infrastructure developers as members, said at least 20 builders that he knows of have asked for extension of repayment of their loans. “From July, many builders have taken loans from private lenders for an annual interest rate of 36% as against banks loans for 12-13% earlier," said Gupta. “There is a cash crunch for many developers and there is no funding for fresh projects," he added. Revenues from the sale of developed properties have also slowed, as buyers have deferred their purchases with interest rates having risen to 13-14% for housing loans. “Developers who are highly leveraged and have bought land at crazy prices are facing the heat," said Vikas Oberoi, managing director, Oberoi Constructions. “Banks are not willing to lend (to) such developers. Overall, they are going slow on real estate lending." 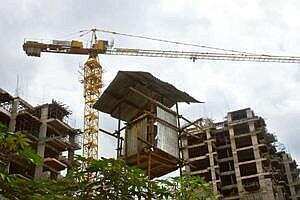 “The RBI has always asked banks to be cautious in real estate lending," noted M.V. Nair, chairman and managing director, Union Bank of India. “The tough market and liquidity conditions have affected the flow of credit to this sector further." Alternative funding sources, such as private equity, are also shying away from realty because of the global economic uncertainty, leaving developers with few choices for borrowings, said Pranay Vakil, chairman, Knight Frank India Pvt. Ltd, a property consultant. “Developers are just left with one source of capital, which is private money lenders. However, they do not lend money at reasonable levels of interest rates." Gupta added that alternative sources of funds from the stock market have also dried up and very few developers can sustain their projects at high interest rates. Credit growth for the realty sector from banks slowed to 31.9% to about Rs14,750 crore as on 23 May, from 69% to Rs19,010 crore in the same period last year, as per RBI data. This, after RBI raised the risk weightage on banks’ commercial real estate exposure to 150% as on 25 May 2006, from 125% on 26 July 2005. The final collateral that developers have—their shares—is also no longer a viable option, with the BSE Realty Index declining 22.77% in the July-September quarter, and with some large real estate companies trading well below their listing prices. Shares of DLF Ltd, India’s largest property developer, which closed Monday 10.33% lower at Rs301.65, are down about 45% from their 2007 offer price of Rs550. The smaller Parsvnath Developers Ltd, which closed Monday at Rs79.20 a share, down 9.43%, has fallen nearly 75% from its 2006 offer price of Rs300 a share. The benchmark Sensex, in which DLF has 0.93% weightage, has dropped 41.83% through Monday from January. “If the current scene continues for 18 more months, there will be bankruptcies," said Arun Nanda, president of infrastructure development at auto company Mahindra and Mahindra Ltd, which is waiting for property prices to fall before making more purchases. Mahindra Lifespace Developers Ltd, the group’s construction subsidiary that is developing 8.3 million sq. ft of land across the country, might still be shielded as it relies more on internal accruals than on borrowings. “Mahindra Lifespace is still a zero debt company," noted Nanda. Even in housing loan disbursements by banks to individuals, a relatively smaller segment than commercial developments, growth slowed to 15.9% at Rs31,735 crore as on 23 May, but this was largely on account of the rise in home loan rates. In the previous year, housing loan disbursements by banks reached Rs41,066 crore growing at 21.6%. The risk weights on housing loans extended to individuals by banks were increased from 50% to 75 % in December 2004. But after a review, banks were advised to reduce the risk weight in respect of exposures arising out of housing loans up to Rs30 lakh to individuals from 75% to 50%. Real estate prices would have to decline more before developers can raise additional money, according to industry experts who note that overrated valuations are still a matter of concern. “Developers will have to accept realistic valuations rather than fancy ones," said S. Srinivasan of Kotak Real Estate Fund, which has invested $220 million (Rs1,045 crore) of the $800 million it has raised. Mumbai-based Centrum Broking Pvt. Ltd, in a research report on 29 September, said it expects a “30-35% fall in India’s residential prices from the peak, with the Mumbai Metropolitan Region (MMR) estimated to witness the lowest fall of 20-30% until April 2009." “The MMR has already seen property prices slump by 10-15% over the past six months in the secondary market. We expect affordability to re-emerge in Mumbai with a further 15-20% fall in prices and favourable demand-supply dynamics vis-à-vis other metros, which would ensure volume growth and lower the asset cycle risk," Centrum said in its report.